Clear lines and precise proportions give the CONNECT a modern, yet timeless Scandinavian look. The sofas 11 different modules provide numerous possibilities for creating the optimal shape arrangement. Designed by leading Norwegian designers Anderssen & Voll, CONNECT is a comfortable sofa upholstered in a range of textiles from Kvadrat. 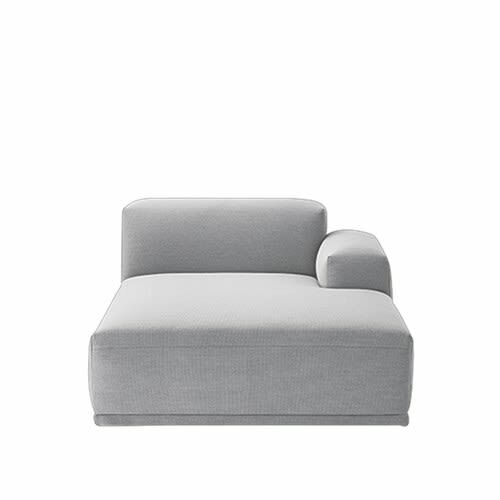 The CONNECT modular sofa series is available in all Remix & Steelcut Trio textiles from Kvadrat for made-to-order purchases. Find a partner retailer close to you for more information. Remove non-greasy stains by carefully dabbing with a lint-free cloth or sponge wrung out in clean warm water. If necessary, clean by dabbing with soapy water or water with a little dish soap. Finally, dab the surface with clean water. See kvadrat.dk for further cleaning and maintainance intructions for your chosen textile.